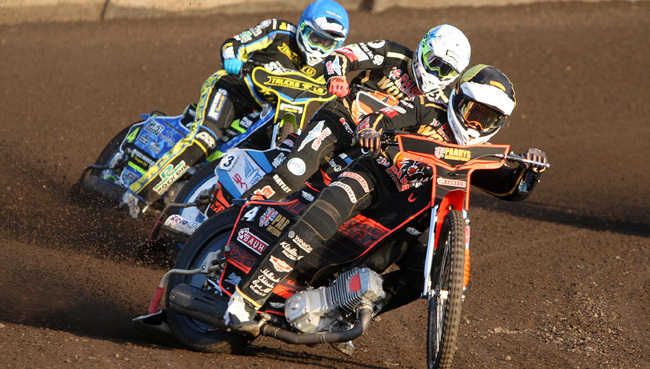 WOLVERHAMPTON ruthlessly put under-strength King’s Lynn to the sword with a 54-36 away win that all but seals Knockout Cup progress. In another stellar team performance, Wolves took the lead with a heat-three maximum and continually stretched their advantage in each race to build a 14-point cushion by the eighth. Swedish stars Jacob Thorssell and Freddie Lindgren led the way but it was Sam Masters who produced the pass of the night, soaring up the inside of Grand Prix ace Chris Holder to beat his countryman in heat six. The second half of the meeting was a procession with only Holder and Troy Batchelor providing any kind of resistance. It leaves Peter Adams’s side on nine wins from their past 10 outings, three of which have come on the road, with captain Lindgren quick to hail the collective nature of recent successes. “It is a nice feeling,” said Lindgren. “With the kind of team we have you don’t have pressure on any one rider, you can rely on anyone to go out and win heats which is really important. “It makes everyone feel more secure, the pressure eases and at the moment we are gelling so well. We have Rory (Schlein) in the side now and it feels like everything has transformed. Everyone is doing their bit. The second leg takes place at Monmore Green on Monday, June 26 (7.30). KING'S LYNN 36: Troy Batchelor 12, Chris Holder 10+2, Lewis Rose 5, Robert Lambert 4, Carl Wilkinson 4, Jake Knight 1, Nicklas Porsing R/R. WOLVERHAMPTON 54: Jacob Thorssell 13, Freddie Lindgren 11, Sam Masters 9+1, Rory Schlein 8+3, Kyle Howarth 6+1, Nathan Greaves 4, Mark Riss 3+1.